There are albums that are brilliant, but have not been available for years. Albums that were released in limited edition and forgotten for years by record labels. These albums are being sold on Ebay for a lot of money. ‘Cape Catastrophe’ is such an album. Fusion bassist Percy Jones, former bassplayer of jazzrockband Brand-X (containing Phil Collins ), Brian Eno and Soft Machine (with among others Karl Jenkins). As a soloïst not graceless either; the music of Jones was picked up by none other than Bert Gerecht, the German who, it is said, is now one of the world’s best bass-professors. He released Jones’ music in 1990 on his own label Hot Wire, but as the label was dropped, due to the rise of the compact disk, most music of the label remained heavily unknown. A shame, but that’s how the music business is. 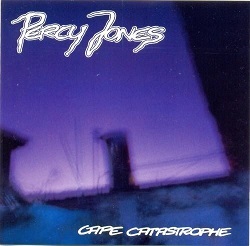 Then, towards the end of 2013, there was a change in the inaccessibility of ‘Cape Catastrophe’, since Gonzo Records heard the album by accident, bought the rights , and re-released the gem. Rightly so, because the album is considered a jewel in the fusion. No, Jones’ play is not comparable to the virtuoso bass playing of Jaco Pastorius, 99 % of the fusion bassists lean on. No, the music of Jones has made its own way and Jones dares to combine it with a variety of synthesizers, sequencers and other equipment, to give the music a late 70s and early 80s sound with its own musical color. Similar to the Mahavishnu Orchestra, but this is Gary Burton.